Touch panel technologies are a key theme in current digital devices, including smartphones, slate devices like the iPad, the screens on the backs of digital cameras, the Nintendo DS, and Windows 7 devices. The term touch panel encompasses various technologies for sensing the touch of a finger or stylus. In this session, we'll look at basic touch panel sensing methods and introduce the characteristics and optimal applications of each. Note: Below is the translation from the Japanese of the ITmedia article "How Can a Screen Sense Touch? A Basic Understanding of Touch Panels"published September 27, 2010. Copyright 2011 ITmedia Inc. All Rights Reserved. A touch panel is a piece of equipment that lets users interact with a computer by touching the screen directly. Incorporating features into the monitor like sensors that detect touch actions makes it possible to issue instructions to a computer by having it sense the position of a finger or stylus. Essentially, it becomes a device fusing the two functions of display and input. It's perhaps not something we think of often, but touch panels have integrated themselves into every aspect of our lives. People who enjoy using digital devices like smartphones interact with touch panels all the time in everyday life—but so do others, at devices like bank ATMs, ticket vending machines in railway stations, electronic kiosks inside convenience stores, digital photo printers at mass merchandisers, library information terminals, photocopiers, and car navigation systems. A major factor driving the spread of touch panels is the benefits they offer in the way of intuitive operation. Since they can be used for input through direct contact with icons and buttons, they're easy to understand and easily used, even by people unaccustomed to using computers. Touch panels also contribute to miniaturization and simplification of devices by combining display and input into a single piece of equipment. Since touch panel buttons are software, not hardware, their interfaces are easily changed through software. 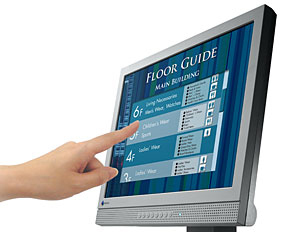 Primary applications of LCD monitors with touch panels. These devices are used in many widespread spheres. While a touch panel requires a wide range of characteristics, including display visibility above all, along with precision in position sensing, rapid response to input, durability, and installation costs, their characteristics differ greatly depending on the methods used to sense touch input. Some typical touch-panel sensing methods are discussed below. As of 2010, resistive film represented the most widely used sensing method in the touch panel market. 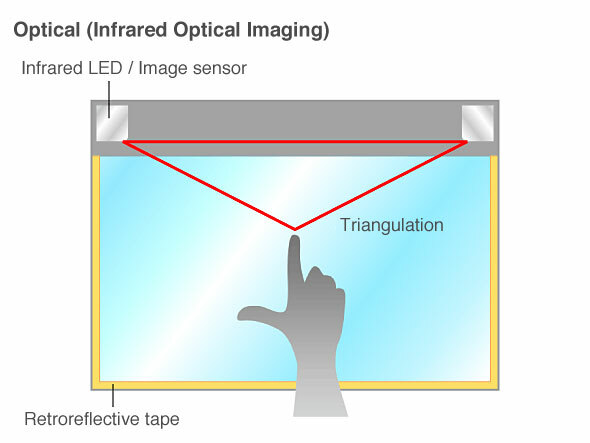 Touch panels based on this method are called pressure-sensitive or analog-resistive film touch panels. In addition to standalone LCD monitors, this technology is used in a wide range of small to mid-sized devices, including smartphones, mobile phones, PDAs, car navigation systems, and the Nintendo DS. With this method, the position on screen contacted by a finger, stylus, or other object is detected using changes in pressure. The monitor features a simple internal structure: a glass screen and a film screen separated by a narrow gap, each with a transparent electrode film (electrode layer) attached. Pressing the surface of the screen presses the electrodes in the film and the glass to come into contact, resulting in the flow of electrical current. The point of contact is identified by detecting this change in voltage. The advantages of this system include the low-cost manufacture, thanks to its simple structure. The system also uses less electricity than other methods, and the resulting configurations are strongly resistant to dust and water since the surface is covered in film. Since input involves pressure applied to the film, it can be used for input not just with bare fingers, but even when wearing gloves or using a stylus. These screens can also be used to input handwritten text. 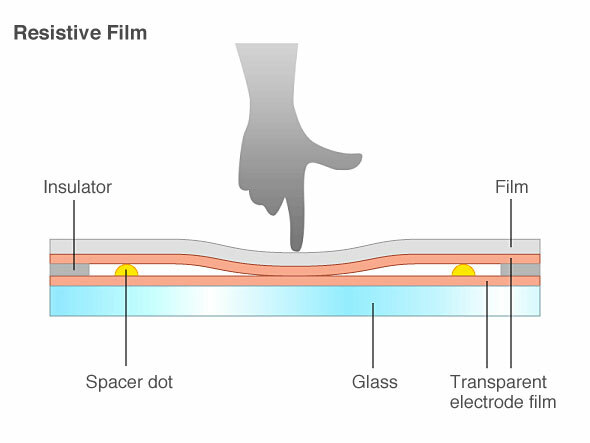 Capacitive touch panels represent the second most widely used sensing method after resistive film touch panels. Corresponding to the terms used for the above analog resistive touch panels, these also are called analog capacitive touch panels. Aside from standalone LCD monitors, these are often used in the same devices with resistive film touch panels, such as smartphones and mobile phones. With this method, the point at which the touch occurs is identified using sensors to sense minor changes in electrical current generated by contact with a finger or changes in electrostatic capacity (load). Since the sensors react to the static electrical capacity of the human body when a finger approaches the screen, they also can be operated in a manner similar to moving a pointer within an area touched on screen. Two types of touch panels use this method: surface capacitive touch panels and projective capacitive touch panels. The internal structures differ between the two types. Surface capacitive touch panels are often used in relatively large panels. Inside these panels, a transparent electrode film (electrode layer) is placed atop a glass substrate, covered by a protective cover. 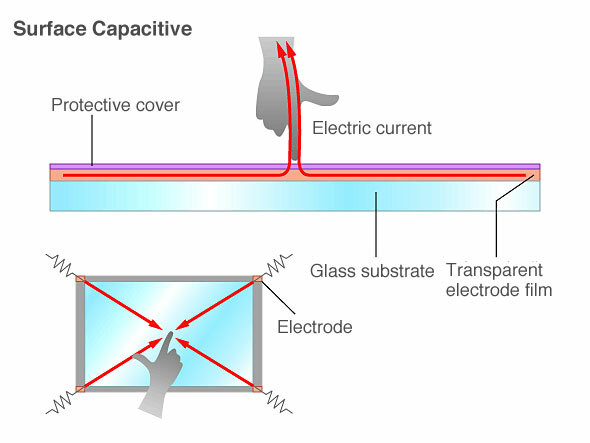 Electric voltage is applied to electrodes positioned in the four corners of the glass substrate, generating a uniform low-voltage electrical field across the entire panel. The coordinates of the position at which the finger touches the screen are identified by measuring the resulting changes in electrostatic capacity at the four corners of the panel. While this type of capacitive touch panel has a simpler structure than a projected capacitive touch panel and for this reason offers lower cost, it is structurally difficult to detect contact at two or more points at the same time (multi-touch). Projected capacitive touch panels are often used for smaller screen sizes than surface capacitive touch panels. They've attracted significant attention in mobile devices. The iPhone, iPod Touch, and iPad use this method to achieve high-precision multi-touch functionality and high response speed. The internal structure of these touch panels consists of a substrate incorporating an IC chip for processing computations, over which is a layer of numerous transparent electrodes is positioned in specific patterns. The surface is covered with an insulating glass or plastic cover. When a finger approaches the surface, electrostatic capacity among multiple electrodes changes simultaneously, and the position where contact occurs can be identified precisely by measuring the ratios between these electrical currents. 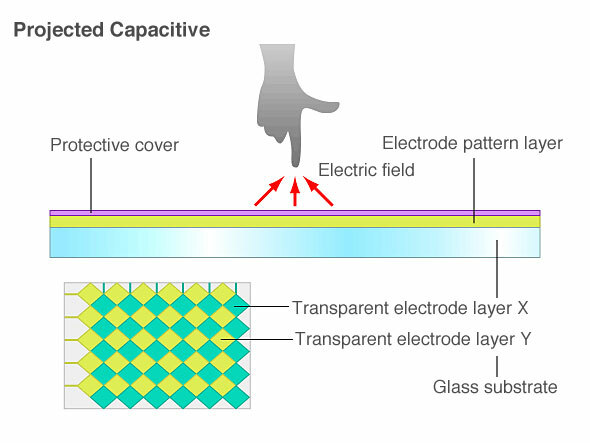 A unique characteristic of a projected capacitive touch panel is the fact that the large number of electrodes enables accurate detection of contact at multiple points (multi-touch). However, the projected capacitive touch panels featuring indium-tin-oxide (ITO) found in smartphones and similar devices are poorly suited for use in large screens, since increased screen size results in increased resistance (i.e., slower transmission of electrical current), increasing the amount of error and noise in detecting the points touched. Larger touch panels use center-wire projected capacitive touch panels in which very thin electrical wires are laid out in a grid as a transparent electrode layer. While lower resistance makes center-wire projected capacitive touch panels highly sensitive, they are less suited to mass production than ITO etching. Above, we've summarized the differences between the two types of capacitive touch panels. The overall characteristics of such panels include the fact that unlike resistive film touch panels, they do not respond to touch by clothing or standard styli. They feature strong resistance to dust and water drops and high durability and scratch resistance. In addition, their light transmittance is higher, as compared to resistive film touch panels. On the other hand, these touch panels require either a finger or a special stylus. They cannot be operated while wearing gloves, and they are susceptible to the effects of nearby metal structures. Surface acoustic wave (SAW) touch panels were developed mainly to address the drawbacks of low light transmittance in resistive film touch panels—that is, to achieve bright touch panels with high levels of visibility. These are also called surface wave or acoustic wave touch panels. Aside from standalone LCD monitors, these are widely used in public spaces, in devices like point-of-sale terminals, ATMs, and electronic kiosks. These panels detect the screen position where contact occurs with a finger or other object using the attenuation in ultrasound elastic waves on the surface. 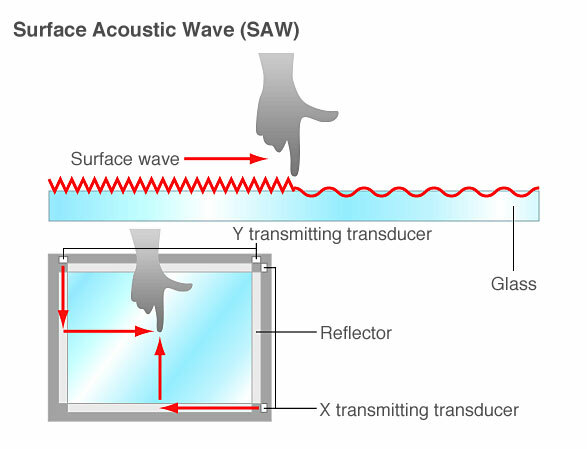 The internal structure of these panels is designed so that multiple piezoelectric transducers arranged in the corners of a glass substrate transmit ultrasound surface elastic waves as vibrations in the panel surface, which are received by transducers installed opposite the transmitting ones. When the screen is touched, ultrasound waves are absorbed and attenuated by the finger or other object. The location is identified by detecting these changes. Naturally, the user does not feel these vibrations when touching the screen. These panels offer high ease of use. The strengths of this type of touch panel include high light transmittance and superior visibility, since the structure requires no film or transparent electrodes on the screen. Additionally, the surface glass provides better durability and scratch resistance than a capacitive touch panel. Another advantage is that even if the surface does somehow become scratched, the panel remains sensitive to touch. (On a capacitive touch panel, surface scratches can sometimes interrupt signals.) Structurally, this type of panel ensures high stability and long service life, free of changes over time or deviations in position. Weak points include compatibility with only fingers and soft objects (such as gloves) that absorb ultrasound surface elastic waves. These panels require special-purpose styluses and may react to substances like water drops or small insects on the panel. All in all, however, these touch panels offer relatively few drawbacks. Recent developments such as improvements in manufacturing technology are also improving their cost-performance. The category of optical touch panels includes multiple sensing methods. The number of products employing infrared optical imaging touch panels based on infrared image sensors to sense position through triangulation has grown in recent years, chiefly among larger panels. A touch panel in this category features one infrared LED each at the left and right ends of the top of the panel, along with an image sensor (camera). Retroreflective tape that reflects incident light along the axis of incidence is affixed along the remaining left, right, and bottom sides. When a finger or other object touches the screen, the image sensor captures the shadows formed when the infrared light is blocked. The coordinates of the location of contact are derived by triangulation. While this type differs somewhat from the above touch panels, let's touch on the subject of electromagnetic induction touch panels. This method is used in devices like LCD graphics tablets, tablet PCs, and purikura photo sticker booths. This input method for graphics tablets, which originally did not feature monitors, achieves high-precision touch panels by combining a sensor with the LCD panel. When the user touches the screen with a special-purpose stylus that generates a magnetic field, sensors on the panel receive the electromagnetic energy and use it to sense the position of the pen. Since a special-purpose stylus is used for input, input using a finger or a general-purpose stylus is not possible, and the method has limited applications. Still, this has both good and bad points. It eliminates input errors due to the surrounding environment or unintended screen manipulation. Since the technology was intended for use in graphics tablets, it offers superior sensor precision—making it possible, for example, to change line width smoothly by precisely sensing the pressure with which the stylus is pressed against the screen (electrostatic capacity). This design approach also gives the screen high light transmittance and durability. The table below summarizes the characteristics of the touch panels we've looked at. Keep in mind that even in devices based on the same sensing method, performance and functions can vary widely in the actual products. Use this information only as an introduction to general product characteristics. Additionally, given daily advances in touch-panel technological innovations and cost reductions, the information below is only a snapshot of current trends as of September 2010. Each touch-panel type offers its own strengths and weaknesses. No single sensing method currently offers overwhelming superiority in all aspects. Choose a product after considering the intended use and environmental factors.